The Memorial Day of 1897 was among the most significant of such days in Boston’s history. 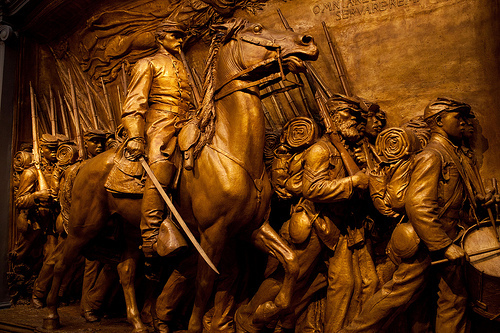 That day, May 31, 1897, had been designated for the dedication of the “Robert Gould Shaw Memorial” on Boston Common. Thus, by 1897, the observance was fairly well established. And in that year, Boston would witness its most momentous Memorial Day up to that time…perhaps ever. The procession in honor of the Shaw Memorial consisted of thousands from the Massachusetts Militia and the United States Army. After parading through Boston, these units formed up in front of the State House and stood at attention while Governor Roger Wolcott and other officials were escorted to the shrouded memorial by survivors of the 54th and 55th Massachusetts Infantries (the two black regiments raised in Massachusetts). The monument was unveiled, ships in the harbor and batteries on the Common fired salvos. And then ceremonies moved to the Boston Music Hall which was packed to utmost capacity. Among the many addresses, the most memorable was given by Dr. William James, then 55 years old, a long-time professor of Harvard University and renowned physician, psychologist and philosopher. Dr. James had struggled with the address. 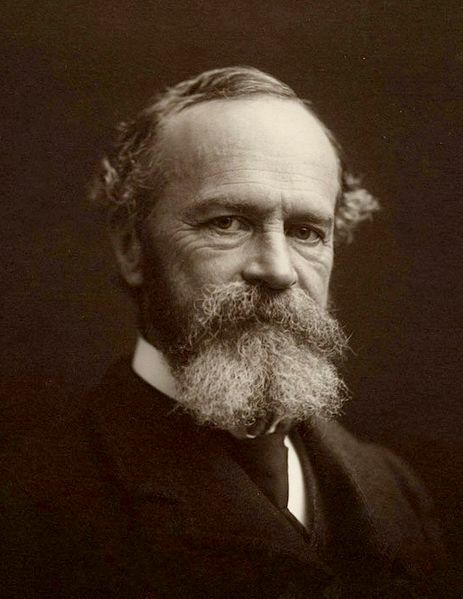 During the war, he had been deeply involved in his studies at Harvard. He also suffered from a variety of illness which prevented him from enlisting. Two of his brothers, however, enlisted. One of them, Wilky James, became an officer in Colonel Shaw’s 54th Massachusetts. Wilky participated in the regiment’s futile charge on Fort Wagner outside of Charleston harbor–the assault in which Shaw and 281 members of the 54th Massachusetts (almost half of the regiment) were killed, wounded or captured. Wilky narrowly escaped death, suffering terrible injuries to his legs which troubled him from the remainder of his short life. He died in 1883. The memory of his brother’s tribulations and his own frustration at being unable to participate in the war perhaps, in part, explain why his Shaw address was so difficult for him to write. Later, he wrote his brother Harry that the speech had been a “schoolboy composition, in good taste enough, but academic and conventional.” I think he was being too hard on himself. The memorial which Dr. James described had also been the subject of some agony by the artist, Augustus St. Gaudens. It had been 14 years in the making. St. Gaudens was Irish-born but raised primarily in New York. He studied sculpture in Paris and Rome then returned to the United States to create some greatly celebrated works of art. The Shaw Memorial is generally regarded as his best. Initially, he intended the sculpture to be an equestrian statue, depicting the young Robert Gould Shaw alone, high atop a pedestal, astride a horse. Shaw’s family would have none of that. They wanted the Colonel of the 54th Massachusetts Infantry depicted with his troops, just as he had died and been buried with them. It would be the first Civil War monument of its kind. No solitary statue of a high-ranking officer, no generic infantryman like so many that had been placed atop Civil War memorials on so many town commons. This monument would depict a unit–officer and soldiers together. And each soldier unique, individual. It is not surprising but nonetheless interesting that General Logan, Captain Adams and Doctor James should all dwell on the same refrain: remember, recall, do not forget. And now there are many working in countless ways to make certain that the photographs do not fade, that the letters and journals survive so that their memories do not sink into the blue gulf of history but that their words and thoughts remain vivid and alive, and that their memorials are marked, cared for and decorated. This Memorial Day, take a moment to remember.